Roadworks to repair a burst water main on Bourges Boulevard in Peterborough have been completed. 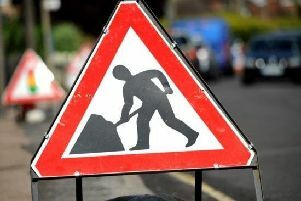 One lane had been closed on the southbound carriageway between Maskew Avenue and Tavernvers Road to allow Anglian Water engineers to fix the burst pipe. It had been feared the lane closure could last into the weekend. However, today (Friday) a spokesman for Anglian Water said: "The lane at Bourges Boulevard in Peterborough has now reopened. "Thank-you to everyone for being patient while are teams got the job done." Yesterday, Nik Shelton from Anglian Water said the main burst on Wednesay and a vacuum extractor is being used to remove the soil so engineers can access the main. He added: "We've had to close one lane of Bourges Boulevard so there may be a small amount of traffic disruption and we'd like to thank everyone for bearing with us, but it's a complicated repair and we're hoping to get this fixed by the end of day tomorrow - Friday, however it is complicated so it may go into the weekend."